Clay learned every aspect of the building trade from the ground up, getting his hands dirty and honing his skills in every aspect of construction. 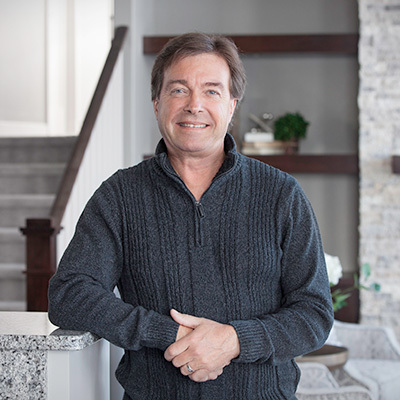 He got his start at age 15, sweeping floors, staining and varnishing trim and mastering his carpentry skills while working with his brother, Brent, first for another builder and then in Dietrich Construction. Over the years, Clay mastered applicable aspects of architecture, engineering and landscaping. He also become an expert on land use and construction regulations while forming strong relationships with the agencies that oversee home building. In 2009, Clay earned the Certified Graduate Builder designation from the National Association of Homebuilders. Only builders who meet specific benchmarks for quality in all areas of homebuilding, such as finance, management and subcontractor coordination, qualify for the designation. In 2014, the Builders Association of Minnesota honored Clay with its President’s Award for outstanding service to the industry. In 2015, the Home Builders Association of Fargo-Moorhead gave Clay its Builder of the Year award, as did the North Dakota Association of Builders. Clay can take a look at a site and in a few minutes tell you exactly what home orientation will be best for views and sun exposure, discuss an initial design for your home, work through details of the exterior and a whole lot more. With his expertise, you’re going to know exactly what will work best for your lot, how much it’s going to cost and how long it will take to build. Clay’s hands-on experience comes through in the homes we build. With more than 40 years of managing construction projects, as well as 26 years as a professional firefighter, retiring at the rank of assistant fire chief in 2009, his leadership skills are well honed. His demand for perfection is the foundation upon which we build every home. Clay built his own home in 1995 in Moorhead, Minn., where he and his wife, Suzy, raised their two children. Like the dream homes he builds for clients, it still functions beautifully and efficiently, has a timeless appeal and offers sanctuary from the everyday demands of leading a growing company.